Pilates is not a meditative medium or a system of gentle stretches. Joseph Pilates was a boxer! Only a handful of instructors in the UK are certified in the true Classical Pilates Method. Pilates is a form of exercise created by Mr Joseph Pilates (a boxer, gymnast, skier and diver!) originally called ‘Contrology’, the use of the mind to control muscles. He believed that modern lifestyle, bad posture, and inefficient breathing were the roots of poor health. His answer to these problems was to design a unique series of life-enhancing physical exercises that help to correct muscular imbalances and improve posture, coordination, balance, strength, and flexibility, as well as to increase breathing capacity and organ function. The exercises mainly focus on core postural muscles that help keep the human body balanced and provide support for the spine. 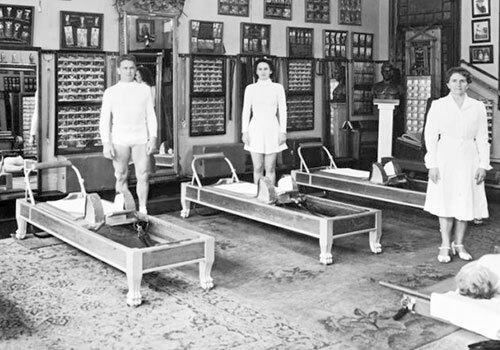 Joseph Pilates' original Studio had Persian rugs on the floor, pictures on the walls and books in bookcases. The apparatus he built was meant to be aesthetically pleasing so it could be placed in any New York apartment! It may not be in NY but I hope you enjoy the light, personal studio I have created here at The Hen House. Come and give it go. You’ll be hooked as well. Get ready for a serious workout! Pilates today can vary enormously. When people say they do Pilates it doesn’t necessarily mean they are practising Joseph Pilates' original exercises or method. Pilates has become a loose term. Mr Pilates’ exercises were devised to keep the body moving, during which movement you can then be challenged. It is not static. In particular, Pilates’ exercises teach awareness of breathing and the alignment of the spine, and strengthen the deep torso and abdominal muscles. His method is now known as ‘Classical Pilates’. No muscle is worked in isolation. His exercises have an order that appropriately warms up the body, challenges and cools it down. His order strengthens and stretches the torso, arms and legs in all planes of movement. This order challenges in the appropriate progression with and then against gravity: lying down, sitting up, kneeling, and standing. The whole body works whilst the mind is controlling the muscles. He meant his exercises to be a workout, a challenge for the individual, to get the best out of his clients, to change their bodies.